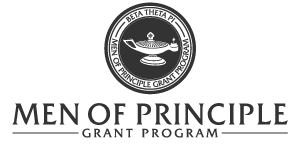 The Men of Principle Scholarship is $500 to help promote your chapter! Throughout the year, chapters need to develop a method for attracting the most accomplished and well-rounded male students on their campus. The Men of Principle Scholarship Grant Program, created in 1999 through generous donations to the Beta Theta Pi Foundation, was designed to do just that. Each chapter can apply for a $500 grant to conduct The Men of Principle Scholarship recognizing outstanding gentlemen, leaders and scholars on their campus. The scholarship is awarded to non-Greek male students who possess the qualities and characteristics desired by Beta members. Further, applicants are not required to join Beta Theta Pi. Be sure to capitalize on this opportunity and execute the scholarship to its fullest potential using the document below. Every chapter or colony that submits a complete application by April 15 is eligible to receive a grant in the following fiscal year (June 1 - May 31). Chapters and colonies that have been approved for a MPS Grant in 2018-19 must claim their grant by May 15, 2019 using the link below. If you have questions, please contact Laura Lednik at the Administrative Office at 800.800.BETA.